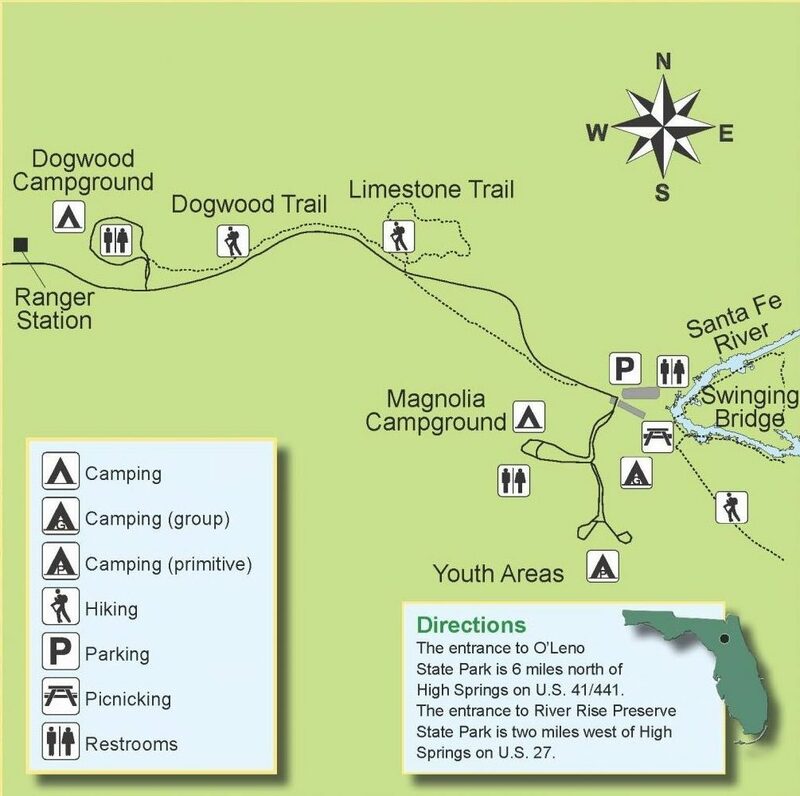 O’Leno State Park is located on the banks of the scenic Santa Fe River, a tributary of the Suwannee River. The distinctive geological feature of the park is the River Sink where the Santa Fe River disappears underground to re-emerge three miles south at River Rise Preserve State Park. Numerous sinkhole lakes may be seen from the trails throughout the park. The Limestone Trail guides visitors to an abandoned quarry that played a significant role in providing building materials for construction during the Civilian Conservation Corps era. The Natural Land Bridge that spans the distance between River Sink and River Rise provided an easy passage over the Santa Fe River from as early as 7,000 BC. The old Spanish trail and the first federally funded road connecting St. Augustine and Pensacola used this crossing. In the mid 1800s, the town of Leno was founded along the banks of the Santa Fe River just upstream from where the river disappears. The first telegraph linking Florida to the outside world passed through Leno. In 1896, the railroad bypassed the tiny town, causing Leno’s inevitable decline. By the turn of the century the settlement was only a memory. The old wire road and mill dams are all that remain of this early pioneer town. Acquired in the early 1930s by the Florida Board of Forestry, the park was developed by the Civilian Conservation Corps (CCC) and the Works Progress Authority primarily for use as a summer forestry camp. Several of the original structures are still in use today. O’Leno State Park is one of Florida’s first state parks. Along with River Rise Preserve State Park, these state parks offer over 6,000 acres of camping, swimming, canoeing, hiking, cycling and many miles of equestrian trails. Some of the most diverse recreation in the area can be found here. The park accommodates family, youth, primitive and group camping. The two family camping areas feature 61 sites, each equipped with electric and water, a picnic table and fire ring. There are centralized restrooms with showers for each area. Youth tent camping areas are reserved for organized non-profit youth groups. Other primitive camping is available at Sweetwater Lake, accessible by a 6.5 mile hiking trail. O’Leno’s Group Camp has 16 cabins, a dining hall, meeting building and an open-air pavilion. The dining hall is equipped with cooking utensils and place settings for 125. The cabins can accommodate 60. Pillows and linens are not provided.